select one of the suggested corrections or replace them with new words/expressions. add words to the dictionary. ignore one or all the occurrences of a word, at once. change one or all the occurrences of a word, at once. Not in dictionary display item - displays the word found on page which does not appear in the dictionary. 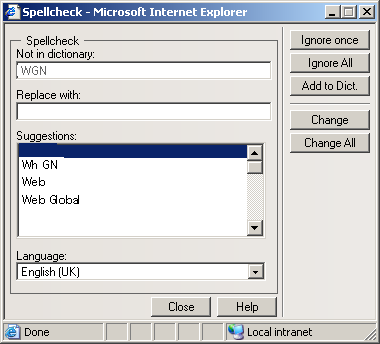 Replace with text box - displays the word selected to replace the word that does not exist in dictionary. Suggestions list - based on the incorrect word found on page, one or more variants will be proposed as replacements. Language drop-down menu - select from the available languages the one you want D-Web to consider when performing the spellcheck operation. Ignore button - ignore the current occurrence of the selected word. Ignore All button - click this button to ignore all occurrences of the word. Add to Dict. button - click this button to add the current "misspelled" word to the dictionary. Change button - change the current occurrence of the selected word with the value displayed in the Replace with text box. Change All button - replace all instances of the word that are encountered with the selected suggestion. Close button - close the user interface and abort the spellchecking process. Help button - open the contextual help window.